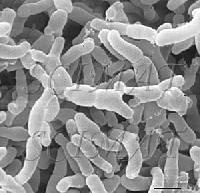 Similar to their better-known relative, Lactobacillus acidophilus, bifidobacteria (often simply called bifidus) are considered to have "probiotic" properties. Probiotics are defined as live microorganisms, including Lactobacillus species, Bifidobacterium species and yeasts, that may beneficially affect the host upon ingestion by improving the balance of the intestinal microflora. It is assumed that the irritable bowel syndrome (IBS) may be related to an imbalance of intestinal bacteria. 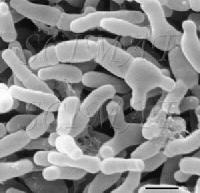 Bifidobacteria are gram-positive, anaerobic, branched rod-shaped bacteria with a very wide variety of species. That link indicates that bifidobacteria have a unique hexose metabolism, called the bifid shunt, which may be used as a diagnostic test for bifidobacteria because it is not found in other gram-positive intestinal bacteria. For access to images of other microorganisms please visit the home page. Commercial interest in images of microorganisms should be directed to photo banks specializing in science such as CMSP, PR, VU and others.